Unity in Action - Intro book for programming games! RPG Maker is a great tool when you're first learning game development, but many of you may want to learn about Unity too. 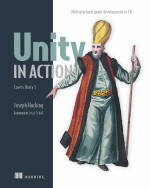 I wrote my book Unity in Action to teach people who already know how to program a little but are newcomers to Unity. You'll master the Unity toolset from the ground up, adding the skills you need to go from application coder to game developer. Based on Unity version 5. You get both the print book and e-book downloads with your purchase! Jesse Schell, author of The Art of Game Design, was good enough to write the foreword for my book. I know a lot of game developers are fans of his book on game design! To get a sense of what the writing's like, here's Chapter 10 that explains how to program audio. You'll need to know how to program, in C# or a similar OO language. No previous Unity experience or game development knowledge is assumed.